While Pike and Discovery attempt to avoid Section 31's tracking, Michael brings her brother to a powerful race of telepaths who can restore his mind -- for a price. Meanwhile Hugh struggles with his identity as he rediscovers his old life. Last edited by GateWorld; March 8th, 2019 at 11:54 PM. The pacing in this one was spot on for yet another episode that had so much crammed in. It had all the right beats to slow down and give us some character moments along the way. Seeing the updated Talosians was awesome. I think they got them spot on. The illusionary communication in Pike’s ready room I was particularly awesome as I noticed it almost recreated a look of glass between Burnham’s side and Pike’s which given the events of the Cage is a beautiful little homage. In fact all of Talos was perfect. The ambient noise of the blue plants and even the look of them with an updated twist. The appearence of it from orbit and the way the sky had a similar tint to it. It was all so lovingly done. Meanwhile I do question why there are forests on Vulcan but... Just because it is mostly a desert world it doesn’t it can’t have other climates. It has to have water after all in order for Vulcans to survive in the first place so I can let that go. Even though it might not ring true with what we’ve seen before I do think it helps to expand the Trek universe somewhat and one of my big things from the old shows is that the universe started to feel a bit small with one-note worlds and races. I was surprised to see Vina though I’m not sure why. It makes perfect sense that she’d be there and I think this episode forms a great middle portion between the Cage and the ending of the Menagerie. I’m not sure the Actress necessarily did the original character justice, but she definitely got across that sense of being a bird in the gilded cage. There was almost a pet like quality to her, with her interactions with Pike coming across as very meaningful which is nice. I think Anson Mount nailed his side of the story. Though it perhaps did seem a little jarring that the show suddenly switched back to the old style 60’s “I’ve known you for five minutes and I’m in love with you” kind of relationships... But to hell with it, it was still cool. Speaking if acting... It was so tough to watch all the stuff with Stamets and Culber. They had such a beautiful relationship. But I can compltely understand why Hugh feels this dissonance with his life. He is effectively crammed into a brand new body. It may look like his own but we learn to experience things in our own way from a very young age with our own individual tastes and feelings. Our body in essence wears down to what we’re comfortable with and Culber has lost all that while still suffering the psychological trauma of dying. And I think the comparisons that can be now drawn between Hugh and Tyler are rather striking. I feel they should bond at some point. I do love the conversation Saru and Pike have about the fight. I was just great dialogue between two actors who are supposed to be having a serious conversation but the wit of the actors just shines through. I have decided I like this version of Spock. Ethan Peck doesn’t try to play him like Leonard Nimoy and that is honestly a good thing, because who could? Instead what we get is sort of a slight immitation of Zachary Quinto’s Spock, but with a lot of James Frain’s Sarek too. Like I can entirely buy that this Spock is the son of Discovery’s version of Sarek because they have such similar voices and general look about them. Burnham’s line about the beard made me laugh along with Spock’s reaction to it. And this episode perfectly shows what would cause this Spock to reject his human side and choose to become pure Vulcan, and even later show so mh contempt for his human side. Despite Burnham telling him she was intentionally trying to hurt him to save him that kind of damage doesn’t just go away. That being said I love how by the end they are much more closer to being brother and sister again. Also the way the flashback shows him take out the guards at the medical station was so Spock and so incredibly awesome. Section 31 was... Well, Section 31. I don’t really have a lot to say about them other than Leland is a bit of a tool. Georgiou is so easy to like even though we know she’s kind of an evil despot. So let’s go over what’ve learned about the Red Angel. First of all that the Angel is human as Spock described it. That is making me think it is Burnham, but it could also be multiple people at the same time. Time will tell. We also know that some kind of threat will destroy the major worlds of the Federation. We don’t know who or what but by all apearences it looks like similar tech to the returned tentacle probe from the last episode. I think I may have now pieced together enough to come up with a plausible theory.. Anyway i am of the belief that the instigating event in all this is in fact the moment when Disocvery launched the probe into the time rift. Whatever entity then took that probe and upgraded it then used it to gather intelligence on the Federation and for whatever reason considers it a threat, possibly due to future knowledge. This will lead them to launch an assault on the Federation. The Red Angel meanwhile is there to stop that threat and indeed the key to doing that is Discovery which is already on a circular path in time. The Red Angel is going back in time to put Discovery on a course that will save the Federation. This starts with saving Burnham as a child. And then we see how it helped save Jet Reno off of the crashed ship in the first episode. I would postulate that she will somehow be integral to mission succeeding. As is Saru who the Angel also saved and put his people on a path of evolution which meant Saru no longer felt obligated to assist them. The odd one out here is the red burst that took them to New Eden. But this event did lead Stamets to use the spore drive, which led Tilly to investigate the meteor fragment on her own to try to help him, which led her to getting infected by May, which led to them finding and rescuing Culber. I believe everything we are seeing is a closed loop in time. An example of the chicken and the egg because whoever the Red Angel is may have had at one time a specific purpose for that suit and its tech to exist but is now being used expressly to guide Discovery on its journey. I also think that whoever is in the suit that we see expressly helping the Discovery crew is not the only user of the suit and likely not its original owner. Events like the actual saving of the church from World War III in New Eden was likely the work of the original entity. I have an additional theory which I have no basis to believe in, that Section 31 may already be in posession of at least some of the technolog that the suits runs off of, and this is in fact why they are so desperate to cover up their evidence, including killing three starfleet personnel to keep their mouths shut about what Spock was seeing. This episode was near perfect. You have said almost everything before me. Story, acting, special effects, dialogues, metaplot, plot twists and so many wonderful character moments. And the "previously on Star Trek part..." bravo. I have never imagined they will make such a strong story cross-over with TOS. I know Mudd was there in season 1 and now we have got Pike, but this was exceptional and I really hope that it will melt the heart of the haters. You were laughing on my Red Angel = Burnham suggestion, but what if it is true? Next step is to fix/merge/rewrite the timelines as a I have suggested. It wasn’t that I was so much laughing. I just found it kinda cliche and would be a bit of a disappointment. But now we’ve met Spock and know their history I honk it would make narrative sense. It would also make an equal amount of sense if it were Spock though. I think we’ll learn more about the Angel next in a couple of episodes time though so we shall see. Yeah...I loved this episode. Top to bottom, back to front. Just flawless brilliance. Any questions from the less knowledgeable Trek fans out there who want some clarification on anything? After all this episode in particular is effectively a spin off from The Cage pilot. What planets were shown to be detroyed? I really loved the camera work in this episode. It was very clever when the children started to talk, but then the adult versions continued the conversations. Brilliant. I loved the Hugh vs. Tyler scene and then the realisation how common they are now. I could have been misreading, but my impression was that it was the core Federation worlds that were shown being destroyed - Earth (we see the missile shoot past our moon before hitting the planet), Vulcan (brown/dry/desolate, with high volcanic activity visible), Andor (the planet's rings were visible), and Tellar Prime (not explicit, but I thought implied because the other three were three of the founding four worlds of the Federation). Yeah I assumed Tellar too. Further backed up I think by the visual confirmation that all four core worlds had Admirals from those races when Leland was speaking to Starfleet command. Have you seen those ships before which fired the bombs? Can this episode win an Emmy for photography? I believe it was outstanding from the whole series. The different camera effects, how it was rotating, which views they have chosen, the different lights etc. IT was really nicely done. Am I the only one, who believed that the shuttle looked very similar to our SG:A jumper? As they have opened the back part, then as they have gone to the consoles, I had a jumper feeling for the whole time. No. To me those ships look like Discovery’s probe again which makes me think they’re more starfleet tech that’s been re-purposed to serve whoever sent them. But we’ve seen very little in the past that looks similar. I can kinda see what you mean in regards to the shuttle and the jumper. I mean really the Jumpers were the ones that were designed to be more like Star Trek Shuttles. I think Star Trek simply created that kind of layout in TNG and it kinda stuck. But I am struck by things like the storage netting along the sides of the passengers area which does remind me of he Jumpers. But I do like stuff like that though cos it’s yet another little visual touch which a) looks very practical and b) makes the show actually look LESS advanced than the shows set later in the timeline. Just heard a lovely little theory based on this episode that part of the reason why Spock enjoys his relationship with McCoy in TOS is because the banter reminds him of his relationship with Burnham. If this episode hasn't convinced the haters then nothing will do it in the future. Oh the haters still hate it. But I have heard positive things from the viewers who are more on the side of "I watch it but it's still not star trek." Plus all I've really seen the haters really complain about is the fact that there's a forest in the Vulcan Forge which is promising. Something must make oxygen on Vulcan too, mustn't it? There are even oasis in deserts, so why could there not be any forests? That is a silly excuse from any haters. They simply can't find any reason to blame the latest episodes. I also loved the scene when Mr. Saru hasn't stopped the fight, but I couldn't find out his reasons. Then it was revealed while Captain Pike told him off and it was "ahhhhh" in my head. The whole conversation sounded realistic and it could support the darker tone of this show, but it has also made sure to return the values of the old episodes. That is one of the reason I liked this episode as they could balance out the old and new things, so I believe this was convincing how a prequel-sequel-soft reboot should look like on television. It has respected the old values, but it has managed to show something new and fresh. And yeah I loved that exchange too. I love seeing Pike and Saru together cos they so clearly make a great team and yet it is such a different dynamic to Captains and First Officers that have been in the other shows. Pike runs the mission, but Saru runs the ship. It’s such a great set up and I hope that it’s leading towards Saru’s eventual promotion to Captain. We actually know from TOS that Pike makes it to Fleet Captain, which is supposedly a rank up from Standard Captain. So I’m hoping that next season we’ll still get plenty of Anson Mount as Pike, possibly from the Enterprise while he takes command of a task force that includes the Discovery so we still get plenty of discourse between him and the rest of the crew and see more of his crew too. Not just SPock but I want more of Number One. The haters aren't worth your time, honestly. Just sit back and enjoy. This is a terrific show, they're only robbing themselves of a good time. I know. What annoys me that people even earn money with hate videos. You know I love reaction videos especially if I like those youtubers, but it feels odd to make the opposite that somebody only makes videos just to express how much they hate it. But anyway I should not care about it. If we could get a new nexgen SG, we should be prepared that such reaction videos will be made for SG as well. Back to the Vulcan. Viewers always forget that a planet is not just one place what they can show in a tv show. It must have climates, seasons, different ecosystems. If an alien would land in the Sahara or at the Grand Canyon they could believe that the whole Earth is like that, but it isn't. Similar mistake happened in Stargate. They have thrown away "useless" planets so easily, while the stargate could have been transported to a better climate instead of deserts... If there is a planet with a breathable atmosphere, then all can be colonized. Just imagine if we could have a portal to an other Earth. Humanity would do everything to discover every single part of it. So what is the fate of Pike? He was the one who was killed in the first reboot movie by the Romulans? I don't remember. Could the Red Angel be Lorca? I know it is weird, but he has fallen into the Sun, maybe he was teleported by the network as well. Or can the Red Angel be any other character form spinoffs? Q? Or can the Red Angel be an alternate Spock? But then he would have felt there is a Vulcan in the spacesuit. That was a cracking episode. Loved it to bits. And isn't the resemblance between the late Jeffery Hunter and Anson Mount really striking? A couple of things bug me though. Throughout Star Trek's 50-odd year history, we keep being told "Vulcan's a desert planet. Vulcan's a desert planet. ", so with that in mind - where the hell are all these trees coming from? A forest? On Vulcan? WTF? And why was the deck of Discovery's hangar bay wet? I don't get that. Surely on a Starship water is a precious commodity, hence the sonic shower. Wouldn't a better method of cleaning the deck just be to decompress, turn off gravity, and let all the dust and other assorted crap float out into space? There are only really three places on Youtube I trust for Discovery reactions at the moment. Trekyards, whose commentators are still fairly... pompous when it comes to Trek lore and canon but know their stuff and they really try their best to be unbiased even though they fail fairly often. Steve Shives, Who is a proper Star Trek nerd but accepts that the show is just for entertainment and doesn’t care about most of the shows changes. AndTriAngulum Audio Studios who does some awesome videos on Trek lore including Discovery. I really want my favourite Youtuber, Lorerunner to do some stuff on Discovery too because he does some proper in depth ruminations on Star Trek episodes but I suspect he won’t cover Disco for a while because he doesn’t like to cover controversial topics on his show. He was alive at the end of the 2009 movie but was killed by Khan near the start of Into Darkness. This actually requires a spoiler for the Original Series timeline. Pike is only brought up one other time in the TOS episode “The Menagerie”. Unfortunately he’s not played by Jeffrey Hunter and in fact Kirk and crew discover that Pike has been in an accident which has crippled him and he is only able to exist in a wheel chair with a blinking light to answer yes or no questions. Spock, being loyal to his formaer Captain, decides to take him back to Talos IV so that they Talosians may give him the illuson of having his old body and allw him to live out the rest of his life with Vina. This leads to Spock acting without orders and has a Court Martial where the evens of the Cage are revealed to Kirk and and Admiral. Most of these feel unlikely. It certainly won’t be Q or another entity from a separate show. We know Lorca won’t be back this season for a fact and almost certainly won’t be an alternate Spock. Though I wouldn’t be surprised if it was the current Ethan Peck Spock. Georgiou is also a plausible possibility. Perhaps an act of redemption on the part of the former Emperor. However I still maintain that if it is any of our main characters then all these events must be a circular loop. 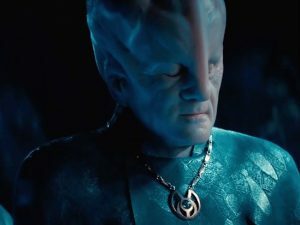 That the suit itself is from very far from the future and due to something that will occur later the character from Discovery has to take the suit to ensure events play out as they have so far done. See Platschu’s previous post in regards to Vulcan. Even a planet known as “a desert world” would still likely have climates and at least small areas where vegetation could grow. Water is also not a really a precious commodity in space. It does take up a lot of space, hence the use of sonic showers. But all it is is Oxygen and Hydrogen, both of which are abundent in the universe. Deuterium, which they use as matter in the warp matter/anti-mater reaction is just Heavy Water. If you are running out then you simply fly through a nebula or gas cloud, collect the gasses with the ram scoops at the front of the warp nacelles and make more. This was something that always bothered me in Voyager because they had whole storylines about how they were running out of deuterium... But deuterium shouldn’t be the thing they struggle to get more of. It should have been the anti-matter that they struggled to get more of.